To rid the world of aggression and contention is the purpose of Aikido. Aikido is a contemporary Japanese martial art, developed by Morihei Ueshiba (1883-1969) in the first half of the 20th century. The Aikido technical repertoire, derived in large part from Daito-Ryu Aiki-Jujutsu, uses joint locks, pins, and throws in response to an attack. While Aikido includes the use of strikes, or atemi, the art doesn’t focus principally on striking an opponent using punches or kicks. The goal of most Aikido techniques is to control an attacker by taking his or her balance, blending with their movement and energy, followed by an immobilization or throw. Aikido has a standard repertoire of defensive techniques, but its most distinctive feature is the philosophy or moral values with which it is practiced: the purpose of aikido is the non-violent resolution of conflict. The ideal of aikido defensive techniques is to neutralize an attack without even harming the attacker. 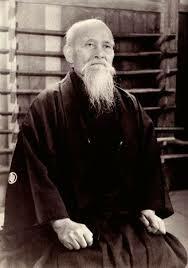 Aikido exists in this principle and this purpose, not in the style of movement or the technical details through which Aikido is taught. If the principle and the purpose are present, any technique can be Aikido. If they are absent, so is Aikido. Aikido practice is a means of self-cultivation and self-improvement, physically and mentally. Aikido doesn’t have tournaments, competitions, or contests. Aikido is practiced in a cooperative environment at a pace commensurate with the abilities of individual students. This doesn’t reflect negatively on the potential of Aikido techniques for self-defense. Rather, the prohibition of competition and the use of cooperative training methods allows students to practice potentially dangerous techniques with significantly reduced risk of injury.